Dedicated to protecting the interests of residents and business owners in the City of Beaumont California by shedding light on local government and challenging our local officials to lead with integrity, transparency and accountability. After Building 20,000 Houses and Refusing to Build Fire Stations the City will Solve their Problems with a Wildfire Safety Program. The City of Beaumont is holding a ‘Wildfire Safety Program’ Monday, July 9, 2018, from 6pm to 8pm. RSVP requested, but not required. When I try to register my computer gives me a scam alert and refuses to allow me to enter. The only option I have is ‘Back to Safety’. Dear Neighbor, Protecting you and your family from the threat of wildfires is our company’s highest priority. Taking important actions to reduce the risk of wildfires has long been a focus for us. Today, we continue to look for ways to enhance our operational practices and strengthen our infrastructure to address the increased threat of wildfires. As a community member, who has a home or business in a high fire risk area, we would like to invite you to join us at a Community Meeting on Wildfire Safety at the Beaumont Civic Center (550 E. 6th St. Beaumont, CA 92223) on July 9, 2018 from 6:00pm-8:00pm. During the meeting, we’ll provide information on our Wildfire Safety Program, including our Public Safety Power Shutoff Protocol and other efforts to help keep our customers and communities safe. Although registering for this event is not required, we are interested in knowing if you will be joining us. Please register online at: https://goo.gl/Xmvfqw. Federal Standards require a fire response time under 5 minutes. Most response times in Beaumont are over 10 minutes and 25% of the population has a 15-20 minute response time. The City of Beaumont only has one small Fire Station and leases their two fire engines from Riverside County. CalFires has told the City they need to build three (3) more fire stations. A total $241,092 is listed on the 2000 Series B thru 2004 C Series Bonds. Fire Station Mitigation Fees were only $181 per house until 2015 and are currently only $532.42 per house. Fire Station Mitigation Fees should be about $990 per house. For years the City has contended that fire protection was the ‘County’s problem’, but State Law dictates and CalFires agrees that the cities are responsible to build their own fire stations. When it was discovered that the City had never built fire stations the City created a faux Fire Safety Committee which resulted in a report stating that some Beaumont Residents were 20 minutes away from fire protection and had no paramedics available at all. Fire Stations cost about $6 Million to build and $3 Million/year to maintain. At the 2016/2017 Budget Presentation the Public was told that there was enough funds to ‘build about 1/2 of a fire station’, but the City had no money in the budget to maintain a fire station on a yearly basis. 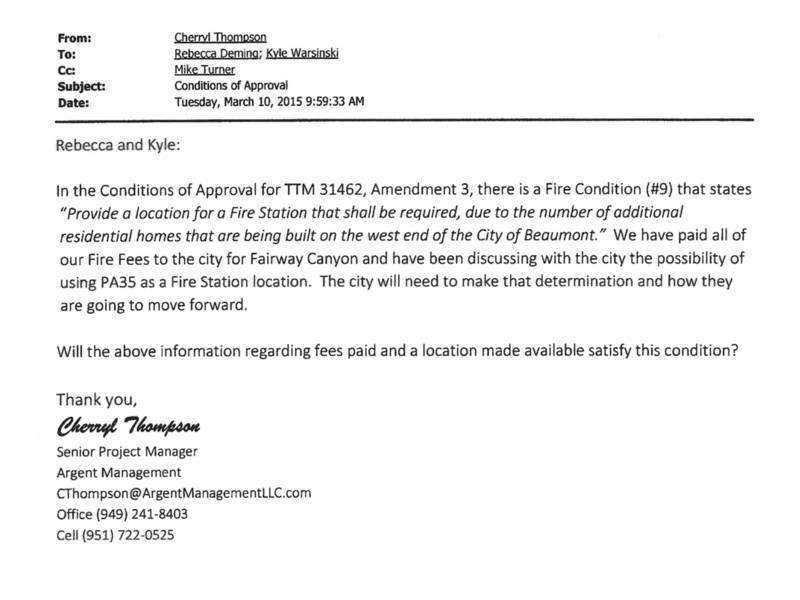 TO THIS DAY the City of Beaumont has no plans to build another fire station. Consultants have states that fire stations will be ‘penciled in’ to the Budget in 2020. Thinking out of the box, please also include the cost, timing and location that County Fire would chose if it built the fire station and charged it back to the City as a facilities and vehicle charge. We could put up a “coming Soon” sign sooner. As you mentioned, Beaumont has in the past owned the station and equipment, due in part to having a prior City Department. Currently, new home fire mitigation balances are nearly $3M for which could be used for annual facilities and equipment charges; this would allow a quicker route to that new station. Please send data on Beaumont #66 calls to other Agencies and Banning and Calimesa calls to Beaumont in the same format as below, to show the benefits of Regional Fire Service. A breakout of all Station 20 calls would also be appreciated. County Fire Sta. #22 responded into Beaumont City 545 times in 2013 (64.2% in under 5 min.) 132 calls are over 5 min. response time. Beaumont City # 66 responded into Beaumont City 1468 times in 2013 (76.4% in under 5 min.) 241 calls are over 5 min. response times. Calimesa City Sta.#21 responded into Beaumont City 148 times in 2013 (36.2% in under 5 min.) 76 calls are over 5 min. response time. Banning Engine #20 responded into Beaumont City 897 times in 2013 ( Contracted at 1/3 cost) 93 calls are over 5 min. response time. 542 calls into the city were greater than 5 min. response time. 1590 calls (52%) in Beaumont City are run by other city or county stations. It more accurate to say that 693 calls (23%) were from others as Beaumont assists in the funding of Station 20 as passed by Council. Calimesa had discussed Beaumont participating in their Summer Wind Fire station until their project stalled. At that time, the three cities developed approaches to placing and paying for fire stations regionally based on per-capita. It is assumed that we are still leaning in that direction, but I will contact the other City Managers once I have your updated data. It’s the cities responsibility to build their own fire station not the county of riverside. With the city employees such as planning department, inspectors, fire marshal, I think the city would be able to do it cheaper. The County Fire Chief and I do not support the idea of a Paramedic only operation. The cost of 6 personnel (2 per day) on a very limited paramedic squad vs. 8 personnel (3 per day) on an all-risk, fully supplied paramedic engine is minimal when you compare their capabilities. The cost for an 8 person fully staffed paramedic engine would be the same as what the cost is for Sta. 66. Attached is the Power Point we provided in the meeting we had with your staff. The presentation gives you the calls for each station and shows that 52% of the calls in Beaumont City are being handled by other fire stations. Riverside County Fire station 22 in Cherry Valley responded 542 times into the city and the cost of the paramedic supplies were paid for by the county. There is also a map with colored dots to visually show the responses to the tournament hills and fairway canyon communities. By adding a 2nd fire station you will also provide better services to not only the tournament hills and fairway canyon communities but you will have faster response times and service to the Solera, Oak Valley, and Stetson communities. We are still working on actual incident time for these areas but the maps I provided to you show the general response times well outside of the NFPA standard 1710 of 4 minutes. The timing for a 2nd Beaumont City fire station is way overdue and should be a high priority for the city. Here is the Banning Fee study. After speaking with the Fire Chief yesterday it appears there is still a need for 3 NEW Fire stations for the build out of Beaumont. They are working to provide me a map to justify the needs of the community to define a new units impact. That’s a good approach but Alan is going to have to see it because it sounds like we are going to be building stations that serve parts of Banning and Calimesa. We have the CV station that benefits Beaumont, but it looks like they want to close Station 20? They don’t feel station 20, which is a State Station counts for local response times. I guess the thing is closed for months of the year? 148:00 CALFire Chief Smith: Data from the U.S. Census Bureau indicates that Beaumont’s populations in 2005 was 19,959 people. It is now slightly over 40,000 which constitutes an increase of over 100%. Fire and Emergency services have not expanded to meet the increased demands placed upon it. As a result; response times have increased. In 2006, the earliest data query that I could rely on, indicated that Beaumont Fire Fighters responded to 2,112 calls for service and our average response time at that point was 3.6 minutes; well under the Four (4) minutes recognized as the National Standard of the NFP, the National Fire Protection Association. 149:00 Smith: Fire Fighters arrived within five (5) minutes to 80.3% of those total number of responses. However 193 calls were answered between 5 – 10 minutes That would indicate that as far back as 2006 we were lagging in our ability to respond expediently to every incident in the City. In 2014 Beaumont Fire Fighters responded 3,029 calls for service, a 30% increase. The average response time rose to 3.8 minutes. Fire Fighters arrived within 5 minutes to 79.4% of those incidents, a decrease from 8 years prior. 496 calls for service were answered between 5-10 minutes, an increase of 59%. 150:00 Smith: You would suspect that if our call volume had increased 30% then our call volume between that 5-10 minute window would also increase by roughly 30%, but instead it was double. What that means is that the expansion in our City is primarily in the southern portion and the southwest portion of the City, which are outside the reach of our current capacity to respond. 151:00 Smith: Last year Calimesa responded into the City of Beaumont 100 times. 87% of our total call volume are for EMS calls and Calimesa’s engine company does not have paramedics. 156:00 Smith: Calimesa’s Engine Company is the only engine company in the Riverside County fire department system of nearly 100 fire stations that’s staffed with only two people and neither of those 2 people are paramedics. So whey they do respond into Beaumont they’re providing an inferior level of service relative to what Engine #66 provides, or could provide. 2:30 Urtiaga: I am aware of a conversation between a Developer and the City of Calimesa offering land on the Southwest side of the 10 fwy, off Cherry Valley Blvd. There is a parcel that has the infrastructure already in; water, electricity. It’s ready to go, it’s been offered. It’s just now waiting for Calimesa to move that station. 207:00 Smith: Calimesa is entertaining two developer agreements; one that’s pledged property for a fire station and the other pledged construction of that station. Wherever they agree to build that station, provided that it’s east of their City proper, then it will provide service to western Beaumont. If they do construct that station on the south side of the 10 fwy, obviously that would ease your concerns, but if it goes to the northern portion of the 10 fwy, they would still have to access Calimesa Blvd to Cherry Valley Blvd. 209:00 Smith: This is part of a larger process that may take a number of years to solve. And that involves construction of additional facilities and relocation of existing facilities. I do have some traction right now from the County to relocate the Cherry Valley fire station closer to Beaumont, which will also help to ease response times, specifically to Stetson and Solera. 2;20 Knight: How many fire stations do we have in the City of Beaumont. Smith: There’s currently one (1) funded by the City. Beaumont participates in an agreement with Banning and the County to fund 1/3 of the personnel of Engine #20 of the Banning Fire Station. You could say that you pay for 1 1/3 fire stations. Of course Cal Fire is frustrated that Beaumont won’t move forward with adding more fire stations. I can envision County/Cal Fire Chief Hawkins wringing his hands together, filled with glee that he again gets to whip out his canned RFP (with disappearing ink) to sell you down the river. He knows a city contracts with them, a city can’t afford to go back to city owned services and your stuck paying their escalating prices. Cal Fire wants to take over all fire services in California and they love, love, love little towns who drink their kool-aid. You see, little cities are all viewed as “Cash Cows” for Cal Fire and your District Supervisor. In Hemet we watched County/Cal Fire Chief Hawkins attempt to sell his snake oil to the citizens and it was shameful. For three years the RFP numbers were tweaked and manipulated by CF and they still couldn’t hide the fact that our 103 year old fire department was far less expensive with equal if not better response times and services. Cal Fire’s Cal Per’s are in the red and the State and Counties need to feed that bottomless pit. Beaumont’s first mistake was contracting with County/CalFire. While there clearly is a need for more stations, the costs for those stations could run the city into bankruptcy. And don’t begin to rely on San Jacinto or Moreno Valley for back-up coverage if there’s a large burn within 30 miles. Cal Fire’s units are prioritized to cover the big fires first and have left cities uncovered for as much as 30 minutes, until another unit from who knows arrives. The City of San Jacinto contracted with Cal Fire and RSO and are now suffering financially and the city is attempting a second vote to impose an approximate 6% Utility Tax (water, phone, gas, electric, trash, TV) on the citizens to “cover LE and Fire expenses” but won’t guarantee that all of the money will go to those services. Moreno Valley, also county fire and RSO, had to cut one fire station and several RSO jobs due to rising county costs. Canyon Lake was just hit with more ridiculously high fees (taxes) to cover Cal Fire services. This is happening throughout the State of California as Cal Fire fees continue to rise and cities simply can’t afford them. This was one of the major reasons Hemet fought and defeated the contracting out of their fire department and Police. The majority council members spend over $1 million in consultants fees (three different consultants to be exact) to ultimately advise them that city fire was the best choice. If Beaumont has only one station, it might be more financially responsible for City Council to wait out the contract with Cal Fire and use the money to rebuild a city owned fire company and add 2 more stations. In the long run, Beaumont citizens will save billions. Chief, Thank you for sending this to me. One question. Is the time limit suppose to be 4 minutes or is it 5 minutes . I really wonder of the people of Beaumont know what the cost would be to add an additional fire station. And that it may cost them more in taxes. Many people complain now if the council spends any money on anything. Just imagine what they would say if the council told them how much it would cost them if they build another station. This is going to be interesting to see what happens. Interesting question…the NAFP is the nonprofit group that sets the “standard” of 4 minutes, but the Fire Department reports are 5 minutes. Our 2014 average was under 4 minutes for all responses. Your information will be kept confidential and you will be able to “unsubscribe” at any time. The City of Beaumont's contract with Urban Logic presents a significant conflict of interest and therefore must be terminated. The City of Beaumont, under Urban Logic and City Manager Alan Kapanicas, has consistently demonstrated favoritism and cronyism in the awarding of pubic contracts. 20 years ago a group of men were looking for cities that would subsidize private sector developments with government bonds and they found the City of Beaumont.. Today the City of Beaumont has $350 Million in Bond Debt, over $100 Million in Lawsuits, and over $100 Million in Mitigation Fees are unaccountable. Urban Logic's contract with The City of Beaumont which allows it to profit from each approved development, along with their on-going practice of awarding high-dollar public contracts to a small group of friends and associates instead of to the lowest bidder, have cost Beaumont taxpayers millions. The policies of Urban Logic and City Manager Alan Kapanicas ignore the needs of existing businesses in favor of new development and big box stores. Urban Logic and City Manager Alan Kapanicas have damaged our quality of life by failing to uphold high development standards, depleting local resources, making local government less accessible to residents, and by destroying the small town feel of the City of Beaumont. Urban Logic protects its ability to extract money from the City of Beaumont at all costs, resorting to intimidation and threats when necessary.